Where'd the past 6 months go? This year has just been amazing, it's almost hard to keep track. Back in 2007, I was convinced it was the best year of my life. I was an average, good girl living my college life one day at a time. Then, I began to step outside the four walls of my good-naturedness and began to discover that there was really more to life than what I was experiencing. I met a lot of new people, tried out a lot of things (no drugs or anything to that effect!) and one day, I woke up and realized that life was so much fun. I would be lying if I say that I do not regret anything that I did but what's important is I lived. Five years later, I know for a fact that this year is the best year of my life... so far. (We'll never know what might happen in the future and I would retract this statement again, haha.) There's just too much happening this year that is beyond my expectations! If you've read my past posts, you know what I am talking about, yes? I did it! After 2 months of incurring tardiness and/or absences, I finally had perfect attendance for the month of June. It's not that I'm usually tardy because the past year, I always get my commission and perfect attendance bonus complete. Somehow, this year, things just get fucked up the last minute and I'd be late. Or is that the same excuse late people always say? Haha. Well, this one I'm still working on. Working very, very hard. Off the list! I am happy and settled in our condo in Makati. Some may say it may be more expensive for me to live there or just the same when I go home in Cavite but I beg to disagree... on the latter. Haha. The hours I consume on sitting (if I'm lucky) or standing in the bus is enough time for me to get some decent sleep or nap. But all in all, I'm happy living there. Lots of fun times! I made it! Finally, I was considered for Real Time Analyst post I applied for since January. Actually, the first time I applied, I didn't make it. But I'm happy that although preparations for the interview were last minute (literally! and big thanks to my boss, Ms. Eve! ), I made it through! I was also considered for this other position at another company. Good thing about this one is that this is not a call center anymore. I'm not certain yet about the pay and benefits but the fact that it is a stable job that is not of the BPO industry is such a big plus. Decisions, decisions. Went out with him yesterday to celebrate. Just a teeny tiny celebration, next week would be better. Hehe. Hi! Yes, I am wearing a dress! I was really feeling under the weather since last Friday. 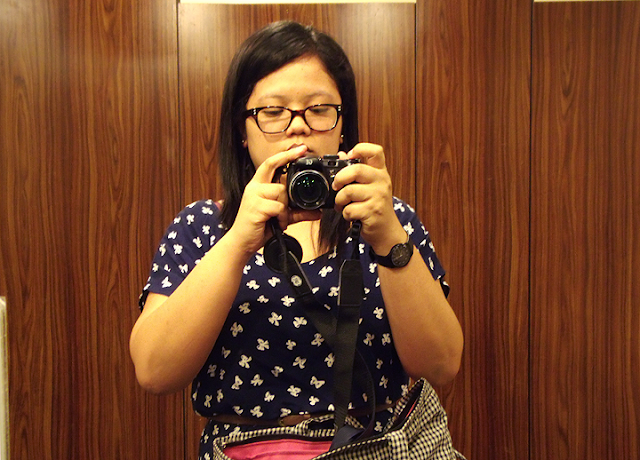 I had colds the entire time but still managed to go to Makati to meet up with him. We went to Globe in SM because he would like to avail of a postpaid line. But there was just too many people that day. We decided to just do it online when we get home. 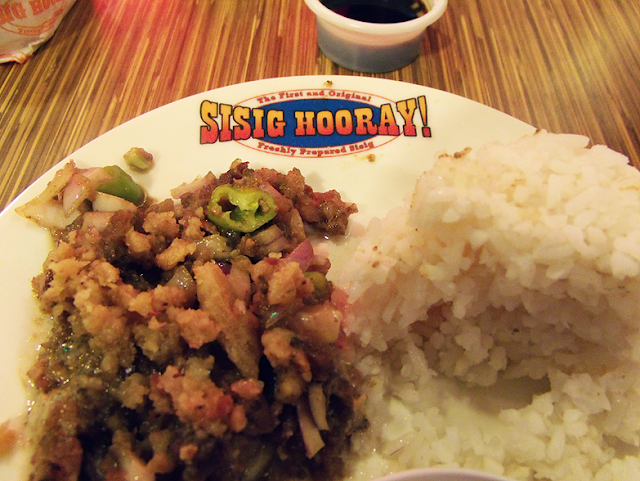 And after weeks and weeks of craving for Pork Sisig, finally got to eat at Sisig Hooray again! It was either this or Lechon Sisig at ChicBoy. Crunchy, yummy goodness and I was satisfied every bit. Then we watched The Amazing Spiderman! I was not really aware of the existence of Emma Stone's fictional character in the movie, Gwen Stacy until I watched the film. I honestly thought she's gonna play Mary Jane Watson. Andrew Garfield's facial expressions were "awakening". Hahaha. Just read online that Gwen Stacy is Peter Parker's first love and she died due to some circumstances provoked by the Green Goblin. After she died, that's the time Peter and Mary Jane got close. I still haven't made up my mind on how to proceed with this cross road in my life. There are a lot of pros and cons to both paths but I really have to choose what will be better for me in the long term. It's just so hard to make a decision right now. But it doesn't change the fact that I have to pick one soon.